Vast majority of tin mirrors available on the world market come from Mexican capital of punched tin production of San Miguel de Allende. This colonial town is located in central state of Guanajuato. First, local artisans were handcrafting sacral artifacts made of metal cans. With the arrival of the second half of the last century American distributors began ordering made of tin mirrors with the purpose of marketing them in the US. It was a breakthrough point in time for rustic decorations production which quickly extended from mirrors to all kinds of wall decor categories. Nowadays, tin mirrors are made in traditional and contemporary styles ranging from art deco to industrial type. Modern frames are often finished as natural unfinished tin metal that has silver color. Colonial type often incorporate Mexican folk art and Spanish influenced motives. Most tin mirrors are decorated with vintage copper or coffee patinas. 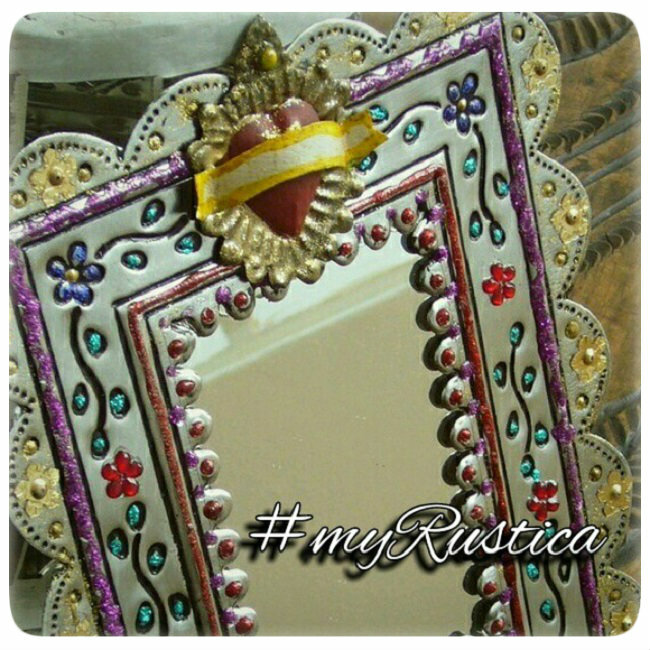 Rustica House brand decorative mirrors are available in standard and any other dimensions. You can buy any model as custom made or send an image of any other mirror frame to copy. All tin mirror frames presented on this site were made by hand at our own metalwork production facility.